As we've told you before, every week, we'll post a picture or illustration here reminding you of the consequences of passing Initiative 912. Here's this Thursday's Disaster Picture of the Week. Remember: If we roll back funds to replace critical structures like the Alaskan Way Viaduct and the SR 520 bridge, then we put ourselves at risk for a disaster in which there will be death and destruction. A collapse is the future of unsturdy bridges and critical structures across Washington State if we don't act. Unsturdy bridges are not only vulnerable to earthquakes - but also human carelessness. The longer we wait, the greater our risk. The photo to the left shows a collapsed section of the Interstate 40 highway in Oklahoma. In both human and economic costs, the collapse of the I-40 bridge near Webbers Falls ranks as one of the worst river disasters in Oklahoma's history. Yet many have argued that the bridge would have withstood the barge impact had it been built in accordance with modern structural standards. The deteriorating state of Oklahoma's bridges was made evident earlier in May by a report from "The Road Information Program" (TRIP), which examined the conditions of Oklahoma's bridges. The study found that thirty-three percent of the state's bridges are "structurally deficient" and seven percent are "functionally obsolete." Researchers also discovered that more of Oklahoma's bridges were built in the 1930s - 24 percent - than during any other decade. 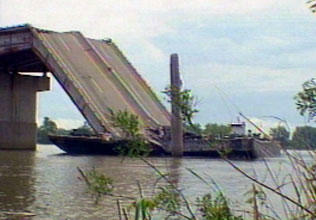 The problem of deficient and obsolete bridges is not strictly local to Oklahoma. According to TRIP and the Federal Highway Administration, approximately one-quarter of the bridges in the United States need immediate repair or replacement, and capital investment in bridge and roadway projects has been far too low for many years. At the time of TRIP's latest national report, this remained the case. The state Department of Transportation (DOT) maintains that the 520 bridge, which opened in 1963 and underwent a major seismic retrofit in 1999, is near the end of its useful life, and must be replaced for the safety of people in the 115,000 vehicles that cross it each day. There's a 1-in-20 chance the hollow columns that support its approach spans could fail during an earthquake. It floats low in the water, and winter windstorms that heave waves across its four lanes stress its aging pontoons and anchors. It has endured several earthquakes and weathered various traffic and boating accidents — including a barge that smashed into a pillar supporting the bridge's high-rise section in 2000, prompting the closure of one eastbound lane for several weeks. Whether the threat be a natural disaster or human carelessness, our aging and critical structures need to be replaced immediately. We can't afford to wait. Katrina likely the worst storm ever to hit U.S.